Charles got up bright and cheerful on the morning of 7-1-2001, shortly after Alex. Soon afterwards, whilst sitting in his favorite chair, he stood up clutching his side and crying out in pain. Following this he slumped to the floor and Alex tried to get him comfortable. Noticing that his skin color was changing for the worse, she phoned for an ambulance and Charles was rushed to hospital where he died about 10-45. X-rays had been taken and the doctor told Alex that Charles had had a major aneurysm in the stomach. Overview Of The Funeral Service by Adrian Harris. "Please stand and raise your (imaginary) glass and toast the memory of Charles W. Cameron". With these words, the Rev. 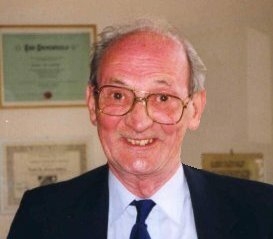 Colin McAuley welcomed the two to three hundred people who had gathered at Warriston Crematorium on Saturday 13th January, 2001 to bid farewell to the Godfather of Bizarre Magik. Simultaneously, at 11am GMT, Bizarrists in various parts of U.S.A. were raising a glass of Charles's favourite tipple, the Famous Grouse in his memory. There was standing room only at what the Chaplain described was going to be a service with a difference. And was it! First the hymns, 'Onward Christian Soldiers', ‘Lord of the Dance’ and 'Mine eyes have seen the Glory' (The Battle Hymn of the Republic), all very lively and sung with great gusto by the congregation. A full resume of Charles life was given and in particular, his role as a founder member of Edinburgh Magic Circle. At an early age, he developed an interest in Mentalism, Psychic research, the Occult, the Supernatural and anything of a bizarre nature. This was to pay dividends when he ran the 'Count Dracula Theatre' in Edinburgh's famous Wax Works for some three years in the late 1980's. He also had regular Newspaper columns, a regular radio slot on Radio Forth as well as having numerous television appearances. He also gave lectures on these subjects both at home and overseas, including the Magic Castle in California. As if this was not enough, Charles was also well known and respected for his great charity work throughout Edinburgh with a special mention of The Poppy Day Appeal when he 'rattled his can'. Charles authored 13 books during his lifetime, and in October 1967 published the first issue of 'The Cauldron' which ran for 11 issues. The Magik Club, of which Charles was also Patron, has been reprinting this very rare magazine free to club members. I am pleased to have been able to offer my own file of this interesting magazine to the Magik Club to allow the project to proceed, as apparently even Charles did not have a complete set! Among those attending the service were representatives from Edinburgh Magic Circle, Lothian M.C., Scottish Conjurors Association, Paisley M.C., Kircaldy M.C., Perth M.C., The Scottish Association of Magical Societies and of course The Magik Club. His long time friend, and fellow Magik Club founder member, Karl Bartoni, carried out the Broken Wand ceremony during the service. Karl's moving personal tribute touched everyone and the lay people in particular found it quite dramatic. "Representing the magic fraternity all over the world and especially your many friends unable to be here today - - we thank and honor you for your overwhelming kindness and major contribution to the world of Bizarre Magic… you started it all. You will live forever in our hearts and thoughts. Farewell dear Godfather and friend. Enjoy the Big Rock Candy Mountain." .